Yolks contain a plethora of vitamins, minerals, and antioxidants that nourish your eyes, your brain, your heart and your mood. A sampling: lutein, selenium, vitamin D, vitamin E, Omega-3′s, sulfur, tryptophan, choline, magnesium, B12, the complete amino acid profile, and much more. 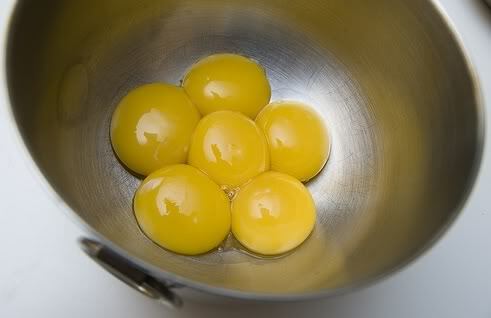 Yolks are truly one of the most dense nutrition sources on earth. Take a look at this rundown from the USDA. – Choose organic or free-range eggs. Better yet, if you live near any farms, see about purchasing fresh farm eggs. The best yolks are a rich yellow. – You can eat eggs after the “sell by” date, but definitely toss them a week beyond that. Fresh is best with eggs, both for safety and nutrition. – If you aren’t sure about the freshness, plunk your egg in a bowl of water. If it rises, it’s old. If it sinks or bobs near the bottom, it’s fresh. – It’s not really a smart idea to eat eggs every day, because allergies can sometimes develop (this is true of many foods). But several eggs a week is genius.